A selection of the speeches and orations delivered at the 2015 Easter commemorations. The first is the oration by Sinn Fein’s Gerry Kelly at Milltown Cemetery in Belfast. Is onoir mor domhsa bheith anseo ag labhairt libh inniu ar an la stairiul seo. Agus is fior la stairiuil e de thairbhe go bhfuil muid cruinnithe anseo ag cuimhniu ar na fir agus ar na mna a chuaigh amach ar Domhnach na Casca agus las siad tine ar fud na tire naoi bliain is nocha o shin. Easter week 1916 inspired generations of Irish Republicans but also peoples throughout the world who rose up against the tyranny of colonial rule, imperialism and oppression. It is a fire still burning bright in the heart of every Irish republican today. I want to welcome you all here, especially the families of our fallen comrades who suffered so much personal loss and grief in our long struggle. I also want to pay tribute to the bravery, leadership and commitment of the IRA in this generation who fought in the streets of our towns and in the highways, byways and fields of our countryside. If courage was the measure of success then Ireland would have had her freedom long ago. Volunteers in the IRA knew that military action alone could not win freedom. They knew that our opponents and enemies had to be faced up to in every sphere of life. This was done in the civil rights movement fighting discrimination and unemployment; in learning and fighting to protect the Irish language and our culture; in creating jobs and building communities, or as a last resort - taking up arms. Armed struggle is not a philosophy or ideology in itself. It must be a decision of last resort in the absence of any other avenue to achieve Justice, Equality and Freedom. It has to be understood and supported by the community seeking its freedom. What can be said of those Volunteers who paid the supreme sacrifice? They were ordinary people with family and friends who they loved and who loved them. What bonded them together was a profound love of Ireland and its people. What made these ordinary men and women extraordinary was their vision of a new Ireland based on freedom and equality. They forfeited their own lives and liberty for that vision so that others could live in freedom. They led from the front and because of this willingness to lead we lost some of our best leaders. There are turning points in every nation’s history. The 1916 Easter Rising had a global effect which has inspired freedom-loving people around the world for almost 100 years. There have been other key events in our recent history such as the popular uprising of 1969 against the Orange state, the terrible events of Bloody Sunday in 1972 and the Hunger Strikes of 1981. The IRA cessation of military activity in 1994 followed by the Good Friday Agreement of ‘98 and the IRA statement of 2005 that the war was over were, I believe, also watersheds. All of them became milestones on the long road to achieve a United Ireland. Yet, there is no miracle in a United Ireland. We have to prepare for it and indeed that is exactly what we have been doing. We are in power in the Assembly in the North and we are the main opposition and only credible alternative to the present failed government in the South. Partition created two conservative states on this island. Both are the antithesis of the Republican principles of Wolfe Tone and the 1916 leaders. Their vision, Sinn Fein’s vision, of a genuine republic governed in the interests of all its citizens, is shared by an ever-growing number of people. Today, people across the island are suffering. Hundreds of thousands are struggling to make ends meet and young people are emigrating in droves. This is a direct result of the unjust austerity policies of both Fianna Fail and their successors in Fine Gael and Labour - mirror images of the British Tories. These parties are imposing eye-watering cuts to public services and working wages, while safeguarding their pals, the bankers and the wealthy. James Connolly wrote that “the cause of Ireland is the cause of labour and the cause of labour is the cause of Ireland - they cannot be separated”. These words are as relevant today as they were then. It is working-class people who are hit hardest by job losses on a daily basis. Austerity is anti-republican, anti-people and anti- equality. But Sinn Fein is leading the political fight back against austerity and cuts. The magnitude of those Tory cuts is putting real pressure on public services, on school budgets, on health and the community sector. We entered the Stormont House Talks to protect the most vulnerable. We defended children with disabilities adults with severe disabilities and the long term sick. We will continue to defend the most vulnerable in our society and we will stand fast to protect frontline services. North and South we opposed water charges. In the South we opposed the property tax on ordinary households. Sinn Fein put forward alternative budgets to deliver prosperity and equality and grow employment. They were rejected by the other political parties. It doesn’t make sense to split an island nation of 6.4 million people into two separate competing economies. There is no question that as a nation we are stronger together than apart. We would be better off economically, socially and politically. More importantly, in a United Ireland we have the power to deliver hope over fear, opportunity over despair. We can carve out a new future together. Sinn Fein is different from other political parties and is proud of that fact. Sinn Fein is a party born in struggle with our membership and elected representatives coming from the communities most under pressure from the deep economic crises North and South. That connection with our community is the bedrock of our politics. The mandate Sinn Fein is seeking in the upcoming Westminster election is FOR equality and AGAINST austerity. We want the economic levers to create and sustain growth. The Tories and some of the local parties however, are seeking to continue with austerity policies, which will cut our public services, destroy the welfare state and force citizens into deeper hardship. This will be the battlefield in the time ahead. So let me spell it out clearly: Equality is a red line issue for Sinn Fein. We will not move back from it. We seek an inclusive united Ireland and Unionists should be assured that Republicans are totally committed to Equality and opposed to all forms of discrimination. That is equality for everybody. That requires increased dialogue and engagement. It means setting aside assumptions about unionists and listening to what they have to say. It also means, all of us accepting that we are part of an intercultural society and that there are many different minority voices we must listen to within it. There is responsibility too on all of us to work towards reconciliation. The British government needs to acknowledge its role as a protagonist in the conflict and the reality of more than a thousand deaths through collusion and British state violence when dealing with the important issue of victims. There has to be equality of treatment for all victims and survivors whether it is from state violence and collusion or from any of the other combatant forces. That is the basis upon which I and other members of Sinn Fein discussed the difficult issues of our collective past. We believe, through the Stormont House Agreement, we have achieved the architecture to deal with the issues of truth and justice with equality at its core. Sinn Fein will continue to stand with the victims in their campaign for the truth from whatever section of the community they come from. 100 years ago, the leaders of the Easter Uprising were already preparing for 1916. We are now preparing to celebrate the centenary. Some elements in the media and some of our political opponents have sought to criminalise our struggle and our party. They have always and will always fail. So on a personal note, I think I can speak for many thousands of Irish Republicans who came through the conflict when I say that we are proud of our time as Volunteers in the Irish Republican Army. We are also proud to have been Political Prisoners. I am equally honoured, as a political activist, to have been involved in peace and political negotiations and to be one of the many Sinn Fein members to be elected to represent our people. There are small groupings within the Nationalist community opposed to the peace process and opposed to Sinn Fein. These groups have every right to disagree with our strategy and we have sought to engage with them on this. But they have no right to carry out armed actions, the vast majority of which are directed against unarmed civilians, in the name of Irish Republicanism. These small groups are not the IRA. The IRA fought a war against State combatant forces and fought it to a conclusion. The women and men we are remembering here today were not war mongers. They were proud Republican Volunteers who took up arms against a massive military machine when there was no other option. Today as a result of the efforts of these republicans there is a peaceful and democratic path to a united Ireland. Now, I don’t know 99 years after the death of our 1916 martyrs what they might have said standing in my place today - apart of course from the legacy of their written words. The Proclamation which was read out on the steps of the GPO has stood the test of time in its relevance. I can’t be sure what my friends and comrades who gave their lives in the latest phase of our long struggle might say either. But, I do know, that those who survived them took up their mantle. Our duty, our commitment to them, is to do the best we can in the times we live in now. To state the obvious, this is not 1798 or 1916 or the 1960s or ‘70s or ‘90s. We must lead; we must use methods suitable and workable to the 21st century, to 2015. That is the onerous task our fallen comrades leave us. Irish politics is undergoing its biggest shake-up since partition. We are at the core of that change. There is much work to do. But we are in the countdown to a united Ireland. We believe that together we can make huge progress and truly transform society throughout Ireland. Sinn Fein now has 5 Ministers, 5 MPs, 4 MEPs, 29 MLAs, 14 TDs, 3 Senators and hundreds of councillors. It is the largest political party on the island of Ireland with half a million votes last year. Sinn Fein is the main opposition party in Leinster House and is in government in the North. We are the fastest growing movement in Ireland. The Sinn Fein message of equality, justice and Irish unity is being heard loud and clear right across the island. We are closer to our goal of a free independent, and united Ireland than ever before. We remain guided by the noble ideals of the 1916 leaders, but we struggle in the context of 2015. We are now in a phase of nation building. What Connolly called “the re-conquest of Ireland by the Irish people”. That requires building the political clout to bring about fundamental change. Let us send out this political message. Not only have we not gone away but we are getting stronger by the day. I came away from our recent Ard Fheis in Derry knowing that our future is in good hands, after listening to a volume of young activists speaking with great clarity, dedication and enthusiasm. One of our greatest strengths as a party is in our mix of generations. Allow me to finish by repeating that comment to all those standing at the final resting place of our fallen comrades and friends in Milltown cemetery or where ever they may be. A Chairde agus a Chomradaithe, We are the living present. The young republicans standing about us here today are the mighty future! Bigi Cinnte go dtiocfaidh ar la. 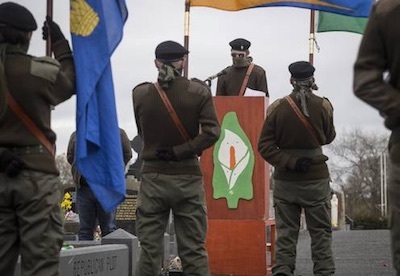 The speech by Derry City and Strabane councillor Gary Donnelly at the independent Easter commemoration in Derry City Cemetery on Easter Monday. Irish republicanism must abandon its obsession with parochial control and adopt with urgency a national concept of winning this struggle. As it stands, on the precipice of the Centenary of the 1916 Rising, republicans are united in failure. No matter which monument you stand at in 2016, no matter which banner or flag you gather under, the answer to the sole question emanating from our patriot graves, as to whether the ideals of the Proclamation are yet realised, the collective answer will be a resounding no. There is no point in seeking refuge for this failure in the failures of others. There is no credibility in criticising the actions of others whilst our own actions remain fragmented. If we choose to stand as Irish republicans then we must address with complete honesty our contributions or not to its advancement. Parochial obsessions feed into the frenzy of organisational dominance in the contemptible illusion that this in some way progresses our objectives. It does not. That mentality demotes the needs of the objectives below the needs for local dominance. This lies at the heart of our current failures. Irish republicanism can only advance if it develops a mechanism through which it can communicate both to itself and to our people. At its most fundamental Irish republicanism must have at its core an internal narrative where the better argument always prevails. As we approach the Centenary of 1916 our first priority must be to re-establish within Irish republicanism a national conversation that allows us to articulate our basic message. The fragmented nature of the republican base at present is testament to the fact that we have lost this ability to communicate. We cannot advance with a parochial mindset. Irish republicanism is both blessed with a rich copy of political analysis throughout our long struggle but also cursed with our unfailing ability not to pay heed to it. Every generation has yielded such figures who have guided us forward precisely because such guidance was for the benefits of republicanism and not any given organisation. Writing almost 180 years ago James Fintan Lalor observed that the struggle between tenant and landlord was a microcosm of the struggle between Ireland and the then British Empire. Here we were given, from the point of a quill, a clarity which influenced Pearse and Connolly to put in place an unbreakable foundation for Irish republicanism to reason its way forward no matter which generation it finds itself in. Writing some 180 years later Ta Power observed that there is no parliamentary road to socialism. What links the two concepts is the inherent need for a national dimension to every local act of struggle we engage in. What is the point in fighting for our right to water but not recognising that partition impinges on our sovereign rights to all our natural resources? A denial of one right is injurious to all rights. Yet daily, despite the repeated clarity afforded to us, we deny our local struggles the national dimension that republicanism and socialism demands. Republicans fighting for partitionist reforms is the same as socialists fighting for fairer capitalism. They are contradictions in terms. The Easter Rising was more than an ideal, more than a vision. The violent insurrection, an armed expression of Irish sovereignty, was a definitive political act in pursuit of that vision. Without this combination 1916 would be an obscure event in Irish history. And this is the salient point for republicans today: what is our definitive political act in pursuit of the same goals? It is redundant to claim loyalty to a political objective without a credible means to pursue that objective. Empathy to historical acts is mere rhetoric in the absence of contemporary acts in support of them. The Easter Rising was an act of political clarity strategically designed to put clear water between the Home Rule argument and the separatist position. And whilst it was an independent act it was not ignorant of the political environment in which it took place. It wasn’t isolationist. It did not retreat into cliches and slogans. It established the national objective with a forward moving dynamic which meant that any claims of loyalty to it could only be properly expressed by political actions in its pursuit. The Proclamation does not belong over the mantelpiece. And this is the template we must build upon today. Republicanism first. Republicanism moving forward. Republicanism with a concept of winning. The Centenary of 1916 offers all republicans a powerful focal point to rid ourselves of the parochial mindset. It affords us an unprecedented opportunity to forge a political strategy which has the dynamic and insight to once and for all liberate our people. Let us get to work and make that happen! On Easter Sunday, Republicans gathered in Togher, Cork City and marched to the Republican Plot in St Finbars Cemetery. Francie Mackey, Chairperson of the 32 County Sovereignty Movement delivered the main oration. The 1916 Easter Rebellion was an armed expression of Irish sovereignty. It was expressed in such a manner because Irish sovereignty was and is violated by the Westminster Parliament. This violation is the root cause of the ongoing Anglo-Irish conflict. The potency of the Proclamation issued at the outset of the rebellion lies in the clarity through which Irish sovereignty was defined. In clear and unambiguous terms Irish sovereignty was defined as an inalienable and indefeasible right of the people of Ireland. And in equal measure, whilst recognising that no foreign parliament had the right to violate our sovereignty, the Irish people themselves have no right to give it away. This places the Good Friday Agreement as a clear breach of these sovereign principles and as such cannot be viewed as the basis for peace between the Irish people and the Westminster Parliament. Our right to national self determination, to be governed by the collective wisdom of our people’s votes, is not in itself dependant on a vote. Voting is an expression of sovereignty but it is not the basis for it. The joint referenda held to endorse the Good Friday Agreement were an attempt to create such a scenario by making national self determination conditional on the votes of Unionists. And here is where the clarity of the Proclamation causes fundamental problems for those adherents of Good Friday but also offers clear guidance for republicans in how to address it. The 32 County Sovereignty Movement took on board this clarity and defended Irish sovereignty from this attack at the United Nations. Our Submission before the UN sets out in the clearest form possible that Partition, and all treaties thereof, are illegal under international law and are clear violations of Irish sovereignty. The importance of this defence of Irish sovereignty cannot be overstated when you consider that Westminster’s first consideration in the so called peace process was to defend absolutely their claim of sovereignty over part of our country. They insisted, even though it meant continuing armed conflict, that the entry fee into negotiations was the prior acceptance of the legitimacy of their sovereign claim to the Six Counties and that all other claims were to be withdrawn. Their strategy from that point on was to sanitise this treaty by a partitionist vote masquerading as an act of self determination by the Irish people. In this they were largely successful except for our actions at the UN. That submission remains the only legal challenge to the British occupation of our country. It was made on behalf of the right of the Irish people to national sovereignty for the 32 Counties of Ireland. It is not the property of any group nor is endorsement of any group a precondition to supporting it. We cannot equivocate on this matter. We cannot depart from the clarity of the Proclamation as a confused strategy to express a political identity. Neither can we reduce the events of Easter Week to mere idealism. The armed rebellion was a definitive political act in pursuit of national rights clearly defined. And herein lies the true challenge of the Proclamation for Irish republicans today. What will our definitive political actions be in pursuit of its realisation? It’s not enough to pledge allegiance to the Proclamation without making that allegiance synonymous with definitive and credible political acts of our own. The first step to be taken in addressing any problem is to recognise that the problem exists. For republicans that first step is to recognise that our fractured state is fundamentally incapable of delivering these definitive political acts. And irrespective of how we tortuously try to justify or lend credence to this fractured state one fundamental reality remains unaltered; no matter which banner you stand under today, no matter which graveyard or monument you attend to remember 1916 we are all wholly united in our collective failure to realise our objectives. The sooner we recognise this reality the sooner we can progress. How can we claim credible allegiance to those who gave their lives in Easter Week knowing full well that our own efforts are hopelessly below par? It’s all the more ironic when you consider that the Proclamation and Rising themselves form the perfect template within which we can address our current malaise. This time next year we will be standing at the Centenary of the most seminal event in our history. What are we to say? Are we to say one group had more flags at their commemoration than another and delude ourselves that that is a victory? We are confronted by a State who wants to honour the British soldiers who executed our Provisional Government. We have pseudo republican parties throwing vast sums of money in a despicable effort to buy the Centenary as an election ploy for a possible 2016 election. We have front groups issuing forgeries of the Proclamation in an insidious attempt to facilitate the Good Friday Agreement as in some way not being in contravention of the original document. All these efforts are being undertaken by groups with vastly more resources than we could ever hope to have. All republicans have at this point in time is each other and all we are being asked to do is act in cohesion for one day out of a hundred years. Surely that is the very least we can do! Ta failte raoimh go leir, anseo ag an chomoradh dun dealgan don eiri amach na casca. On behalf of the movement I would like to extend solidarity greetings to our imprisoned comrades in Maghaberry, Portlaoise and Hydebank who have spent another year weathering the British storm and refusing to allow the state to criminalise our struggle. Republican Network for Unity salute their resilience and fortitude, and pledge to continue to assist their fight for the implementation of the August 2010 agreement. It is an honour to deliver this speech today at Dundalk’s 99th anniversary of the Easter rising, also paying attention to all those who have paid a huge sacrifice for the national liberation struggle, through long years in jail or an eternity in the grave. They are the backbone of our struggle and we gathered here today are the revolutionary remnants of those who fought to realise the Republican aspiration. This is the 5th year our movement has gathered here at the final resting of Oglaigh Thomas McKeown, John McNulty, Thomas Murray, James Melia, Thomas Lennon and Joseph Ferguson who were deliberately and brutally executed by the native defenders of British interests in Ireland. A reality which many homes have suffered in this country throughout the long years of struggle, from Belfast to Cork. These men, and the hundreds that preceded and followed them died in a perpetual conflict between the oppressed Irish people and the British state, which has for centuries, shown a blatant disregard for the will of the Irish population. A will that has been reaffirmed by the most oppressed sections of Irish society, who have consistently refused to allow British supremacy to usurp the expression for national liberation, a country free from external impediment, controlled and determined by her own people. Let me note that as proclaimed in 1916 on the steps of the GPO - Irish sovereignty is inextinguishable and indefeasible The Irish Republic that these men died for is the same Irish Republic that we strive for today, the same Irish Republic which has inspired thousands to strive toward revolution. That Irish Republic cannot be achieved through a gerrymandered border poll, designed to reinforce consociationalism, ultimately isolating and marginalising those who hold out for the only acceptable solution to the Irish question; A 32 county socialist republic. While proponents of Good Friday will point to a litany of language which they claim promotes a Republican narrative - such as the term ‘self-determination’ - we remind them that this was simply a refurbishment and redress of the Unionist veto. The secretary of state controlled border poll provision contained in the agreement which allows the minority to dictate to the majority is what is meant by ‘self-determination’ in GFA terms. The fact, in line with the agreement that an unelected and undemocratic secretary of state maintains dictatorial powers over any progression toward Irish unity should automatically cause all right thinking Republicans to reject it outright. Even if the secretary of state decided to grant the Irish people the scraps off the British table, any yes vote in the gerrymandered border poll would be non-binding and must be submitted to the assent of the British parliament at Westminster, who have been the enemy of Republicanism since its inception. It’s no surprise that we gathered here today, taking head from our Republican martyrs, refuse to allow Britain to set the parameters on Irish freedom. As Republicans and democrats, we rubbish the discourse contained in the GFA which, if you scratch the surface shows up as a small group of individuals protecting their own selfish interests in Ireland. These selfish interests are reinforced by an overt and covert military regime which stalks our streets, homes, friends and family. The British military intelligence services, MI5 are the guiding hand behind the black operations we have witnessed the PSNI undertake in recent years, including spying, recruiting children, conspiring with the judiciary and facilitating the internment of Republican activists. They have directed a campaign of coercion and intimidation against our communities in an attempt to depoliticise them and drive them away from the Republican struggle. They operate from the shadows to carry out their activities while attempting to hold themselves up as the face of justice in our communities. The PSNI under the control of MI5, regardless of their fancy rhetoric are NOT the face of justice in our communities. They harass, cajole, brutalise and coerce while attempting to recruit young children and criminals for their own political ends. They continue to allow anti-social elements to destroy our communities in exchange for their services, this is not the actions of those who have the interests of working class communities in their heart. British rule in Ireland also relies on the subservience of those who sit in Stormont - backed up with an increasing military presence which is set to be further entrenched with the reintroduction of the SRR, another aggressive British militia whose goal is to move along the transition of the 6 counties into a police state. Not to mention the thousands that are situated in barracks across the 6 counties waiting to be deployed at any minute. In recent times, criminal gangs, no doubt operating on behalf of the same British intelligence services have attempted to hijack the Republican struggle in an attempt to give themselves political cover for their abhorrent criminality. Like their employers they have failed, as we steadfastly faced them down and refused to allow them to tarnish not only our name, but the name of Republicanism. Equally as abhorrent is the attempt to rewrite history and inject revisionism into Republicanism. We have witnessed the Blueshirts, along with others, attempt to rewrite the cause of the martyred dead and the 1916 proclamation itself. These people are disengaged from reality, they have no aims to further the Republican struggle, they are simply using it for their own electoral purposes. The proclamation is a work in progress, it has not been realised yet. This revisionism of a revolutionary cause can only be halted by Republicans by spreading the Republican message and bringing it to the home of every individual on Irish soil with relentless vigour. There is very little to say that hasn’t been said about the struggle for national liberation in Ireland, however there is certainly much to do. Leave this graveyard today with renewed energy, optimism and in the spirit of determination commit yourselves to rebuilding the Republican struggle. While looking back in poignant remembrance, take the time to look forward, plan for the future and ask yourself what you can do today, tomorrow and the next day to further the realisation of the ultimate goal. With vision, energy and determination there is no doubt that we will quell all attempts by Britain to destroy our nascent revolutionary movement and put an end to the aims of the forces of reaction to rewrite Republican history, goals and values. So comrades, lead the way.